SAMe Also known as s-adenosylmethionine, benefits bodybuilders by supporting joint maintenance and recovery. SAMe is part of the process of the production of Glucosamine, which is an important component of the joints and this has great benefits for bodybuilders and strength athletes as these individuals are hard on their joints. Also see Chondroitin. 400-600 milligrams per day; half in the morning, half in the evening. Preferably on an empty stomach. You can accelerate the benefits of SAMe by “loading”, which means starting off with higher doses to raise the amount in the body, then tapering off to a maintenance dose. Read more about SAM-e at Wikipedia. SAM-e, or s-adenosylmethionine, is made naturally in the body and is an important component in normal functions of the human body. 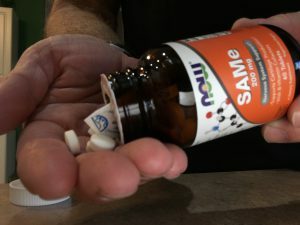 A form of SAMe is sold as a nutritional supplement in the United States, but SAMe has been available in parts of Europe as a prescription drug for years. Its scientific name is S-adenosylmethionine. As we get older, the amount our bodies naturally produce is not enough for general health and may need to be supplemented. SAMe has been found to be generally well tolerated. Some common side effects reported include anxiety and skin rashes. SAMe has been shown in multiple medical studies to help relieve the symptoms of arthritis.